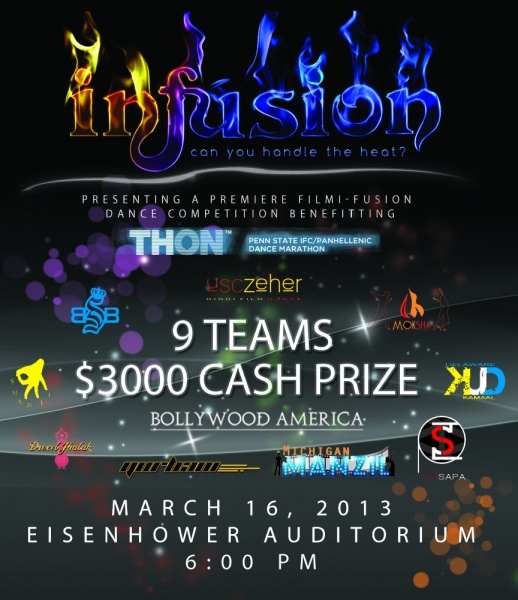 Nine dance teams from across the nation will compete this Saturday in Penn State’s first Infusion Filmi-Fusion dance competition, for a $3000 cash prize and bragging rights. The Filmi-Fusion genre is the newest South Asian style of dance that is sweeping North America. A combination of Hindi-Film Dance and Fusion, this style mixes western dance technique with traditional Bollywood tracks, for high energy and visually stunning performances. Internationally renowned artists “The Bilz and Kashif” from Montreal, will also take to the Eisenhower stage during the Infusion competition. Get your Bollywood fix this Saturday, March 16th at 6 p.m. in Eisenhower Auditorium. Tickets are $6 via online pre-order, and $10 at the door for Penn State Students.